This page will explain the simple technique devised by Dr. Steve Cripps, for predicting output power of microwave amplifiers based on load-line analysis. The so-called Cripps technique has substituted for large-signal models and load pull data quite successfully. Sometimes the simplest ideas are the best ideas, and this is a case in point. Cripps first published his idea in 1983 in A theory for the prediction of GaAs FET load-pull power contours,â€ in the IEEE MTT Symposium Digest. 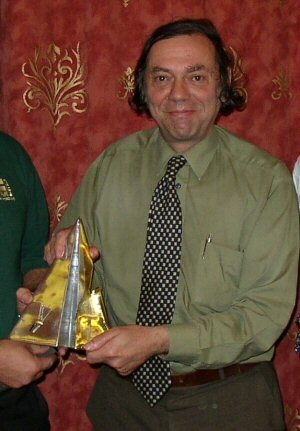 Here's a photo of Dr. Cripps receiving a "best paper" award in 2003... probably not his first, nor his last. You can read his resume here.